Boldly Gone is about the captain (and crew) of the USS Mandela during the time of Star Trek: The Original Series. It will update on a sporadic basis because both creators are involved with multiple other projects that they actually own. "[…]if you love Trek, give this a read." — Dan Seitz, Gammasquad. "I can only imagine what quick-witted torments they'll have for our simply average captain." 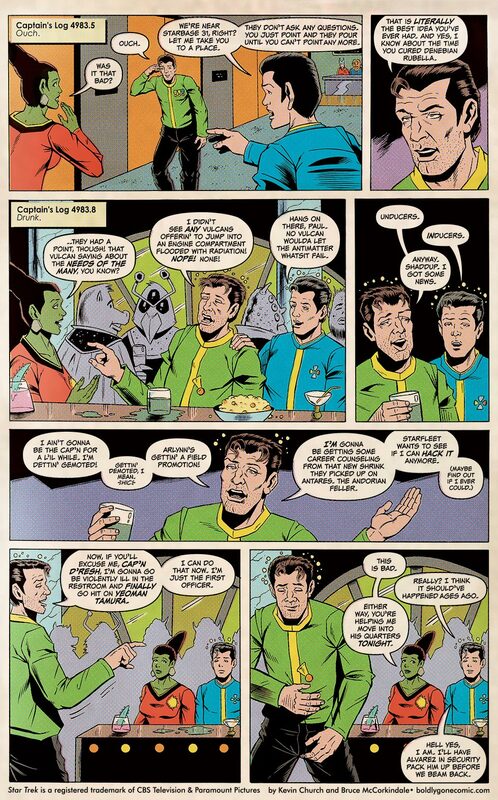 "Although it originated on the television air waves, Star Trek has boldly gone to a number of mediums, including comics. But this new voyage is taking it in a more harrowing — and humorous — direction." This is a not-for-profit venture. Obviously, Star Trek is a registered trademark of Paramount Pictures and all characters and related marks are trademarks of Paramount Pictures. Why, remedy hello there. Is this thing still working? I hope so, because Bruce and I have some new tales to tell. I check this bookmark for the first time since New Year’s and you put one up TODAY?? Keep ’em coming! It’s always a good day when this pops up in Feedly! Right on, Kevin! Great to see you’re back and boldly goin’ again! Good to see this is back! Ming Doyle She draws the comic. The Loneliest Astronauts They also make this comic.